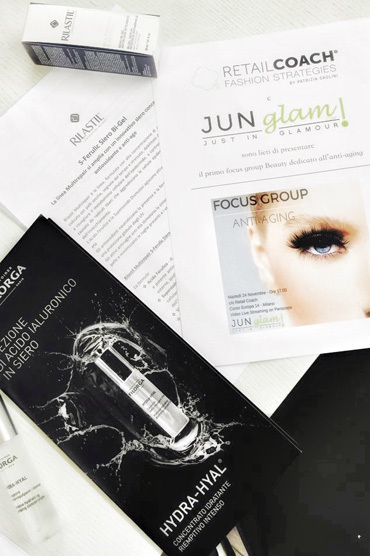 When JunGlam talked to me about the idea to organize a Focus Group on anti-aging products, as a fan of the latest beauty routines, I have immediately agreed on the initiative. When I realized that I could also support the group as a coach, I was really rejoicing! Not only because I think that coaching is an excellent method to develop human potential, but also because Group Coaching, for ten years, that is when I created the Retail Coach brand, has been my bread and butter. Indeed, since 2006, my mission has been clear: improving customer service levels of luxury stores. Obviously, in the last few years, I have had the opportunity to collaborate with the most renowned brands, both in clothing and accessories, design, food and, of course, beauty. Being in touch with both companies servicing consumers and customers, who are increasingly interested in new products on the market, has led me to define a coaching style dedicated to developing awareness on the different types of purchase. Therefore, when the Focus Group was organized, my office was literally invaded by any kind of anti-aging products, not only Italian, but also American, South African and even Korean products, meaning that interviewees were really interested in the latest products. Being both a coach and a fan of beauty, I have therefore facilitated the typical exploration path of Group Coaching, while girls, though working as a group, have identified different goals, as they had different skin types. A closed-number group, involving a maximum of ten participants, was spontaneously created on FB (we have all subscribed to the Moda e Bellezza Focus Group group – that is Fashion and Beauty Focus Group) and everyone was ready to share their experience in anti-aging products and to be involved to focus on this main topic. When we met, the macro-objective was identifying all steps needed to getting to purchase anti-aging products, which has led the group to identify nothing less than seven specific steps (see infographic). Later, two rejuvenating beauty products were tested for a whole month, considering time availability and daily routines of each participant. And it was this that allowed us finding out that is not easy at all for women working hard and having young children to find a “care” moment for themselves. The actual protagonist of the focus group therefore turned to be human experience at the service of beauty, as potentials trained during this meeting have been curiosity, leading to the wish to discover and know, love for beauty, pushing to maintain one’s personal aesthetics and vitality, which is at the basis of taking care of oneself. The focus group follow up will come up soon. Stay tuned to find out about participants’ experience after testing the two products… Happy New Year!